What About Vaping? What’s The Straight Scoop (If You Ignore The People Who Are Trying To Sell It)? E-cigarettes, e-Hookahs, and vaporizers are completely unregulated by any agency, so their safety and effectiveness has not been tested. 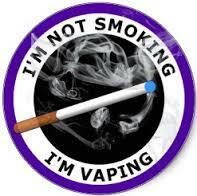 No one can say that they are safer than other tobacco products (such as non-combusted tobacco products). This is one major reason why public health officials are reluctant to tell people to use them. This entry was posted in addiction, denial, smoking and tagged E-cigarettes, Hookah, nicotine addiction, recovery, Vaping on April 6, 2014 by Bill.